Dr. Katherine Grigg is a native North Carolinian. Both her parents, grandparents, and great grandparents are from the Piedmont of NC. She grew up in Charlotte but found the pace of a smaller town more to her liking. After graduating from UNC School of Dentistry in Chapel Hill in 2004, Dr. Grigg spent a year working at the Haywood County Health Department caring mainly for under-served children. She then moved to Wilmington and worked in private practice for two years before her love of the mountains and Western North Carolina drew her back to this part of the state. 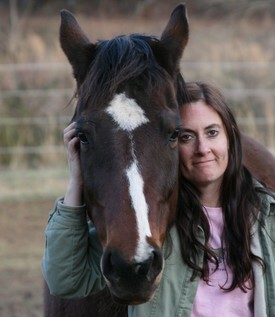 She and her husband, live in Morganton on a farm along with their horses, donkeys, dogs, cats, and chickens. When not at work, Dr. Grigg loves spending time with her animals, riding her horses, gardening, hiking with her dogs, kayaking, running the occasional 5k, and expanding her skills as an amateur photographer. Dr. Grigg is very excited to be practicing dentistry in Spruce Pine. She looks forward to getting to know each of the patients and learning more about the community. Providing the best dental care and creating lasting relationships is what she strives for, carrying on Dr. Thompson's legacy of excellent dentistry and love for his patients.